This water purification pitcher uses HaloPure microbead technology to remove bacteria and viruses. A particle filter removes sediment and an adsorption process uses granular activated carbon to remove taste, odor and color compounds from the water. 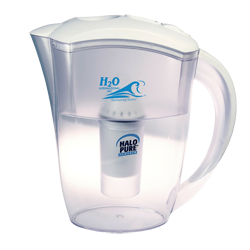 The pitcher purifies up to 373 liters of water before cartridge replacement.